Parliamentary testimony this week documents that the Harper government was knowingly complicit in the torture of Afghan civilians - many of whom were not even suspected of being enemy Taliban. Mr. Harper's government has disgraced us and our country's good name in front of the entire world. Lieutenant Pierre-Vincent Daigle from the Construction Management Organization discusses the progress of various reconstruction projects taking place within Deh-e Bagh with the local Afghan Project Managers. Stabilization B Company is currently led by Princess Patricia's Canadian Light Infantry (PPCLI) and is composed of Police Mentor Teams and Civilian-Military Cooperation elements, and Whole of Government organizations including the civilian police, and the Canadian International Development Agency (CIDA). Stabilization Company supports the local authorities of Dand District, located South of Kandahar City, to set the conditions to improve security, governance and development in cooperation with the population. 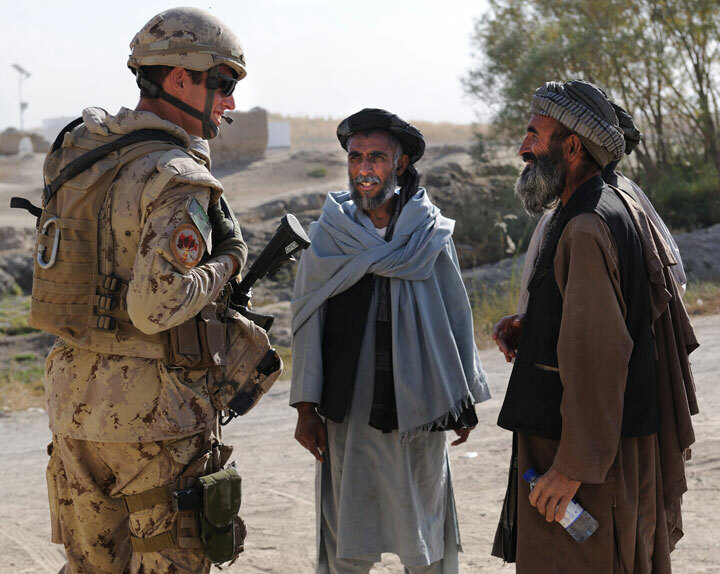 Joint Task Force Afghanistan (JTF-Afg) is Canada's military contribution to Afghanistan. Canadian operations focus on working with Afghan authorities to improve security, governance, and economic development in the country. The Canadian Forces (CF) contribution in Afghanistan comprises over 2,750 soldiers, with the majority serving with JTF-Afg at Kandahar Airfield and Camp Nathan Smith, home of Canada's Provincial Reconstruction Team (PRT), in Kandahar City. Additional personnel are assigned to various military headquarters, support bases in South-West Asia, and work in close support to various civilian organisations in Afghanistan.